Bibliographic Information: Freedman, R. (1987). 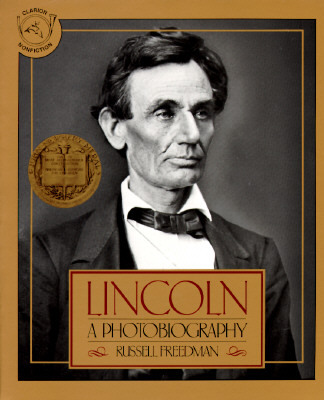 Lincoln: A photobiography. New York, N.Y.: Clarion Books. Personally, I have never been a reader that was interested in non-fiction books. When I saw that I had to read this book next, I was not excited. Don’t get me wrong, I am open to new things but history was never my forte. Now after reading a few pages, I do admire the fact that Freedman included images but I saw this book as a child-version of a history text book. Now obviously the only lesson in this book is about Lincoln but I see this book as a great way to introduce textbooks to kids. Like I said, since i do not like history and am not a fan of non-fictional books, I was a bit biased but after reading the book I tried to think of a positive way to use it in the classroom. I would use this book if kids had to do a presentation on a president or even just a biography about a person. Again, this isn’t my personal pick for books but it was nice to read something outside of my preference. Since this book is a biography, it is a bit difficult to identify the point of view and plot of the story. This book is about Lincoln’s life so I think the only plot would be his death since he was shot. The setting takes place in the United States, again since this is a biography there is no specific setting. Although I do not enjoy history or non-fiction books one thing I did appreciate in this book was the use of pictures and quotes throughout the story. I feel this added life to the biography (not to say his life was boring) and made readers more intrigued to the book. Lesson objective: Students will be able to compare and contrast President Lincoln’s life to Martin Luther King Jr’s life. (The reason why I am having students compare these two outstanding leaders is because I feel they had a lot of similar leadership qualities since they both wanted justice for the people, did not promote violence, and were assassinated. 1. What does “emancipation” mean? 2. How could’ve Lincoln became a lawyer if he barely went to school? 3. How do you think Lincoln felt when the Southern states broke away from the United States? Lesson Activity: Students will have their own presidential election in the class! They will be split into groups (parties) and will have to campaign, do their research, and have to follow similar steps that a past president has done. At the end, the winning party will receive extra credit! Abirached, Z., & Gauvin, E. (2012). 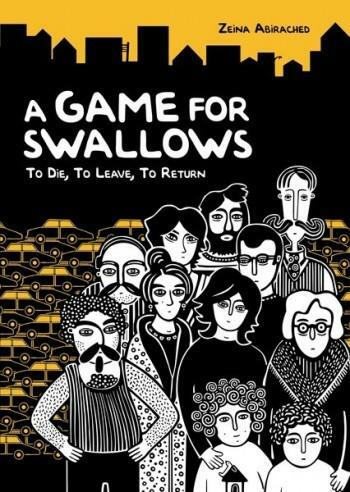 A game for swallows: To die, to leave, to return. Graphic Universe. I honestly did not like this book. Maybe this is sexist to say, but I thought it was more a “boy book”. This book was about a girl who was growing up in the Middle East, Lebanon to be exact, during the civil war. Now, right off the bat I really do not like war stories. They depress me and I hate to envision myself living in that situation. All war stories end with some character dying or someone being traumatically affected by war and that book did exactly like that. Zeina’s parents never came back and that affected her and her brother immensely. I think the other reason I did not like this book was because when I read, I always like to imagine I was the main character and in this case, I do have a little brother who I love and protect. So to imagine myself living in the middle of a war zone, with no parents and my little brother to look out for is very depressing. I did enjoy the sketches though. It seemed very much like “doodling” yet very intricate as well. The setting takes place in Beirut, Lebanon during the Civil War. Beirut (the city they live in) is divided into two places due to religion and the plot of the story happens when Zeina’s parents do not return form the other side of town. I honestly do not see a theme to this story except for being grateful for your family. Since this story takes place right in the middle war, it is hard to imagine living under those conditions. Especially when her parents don’t come back, the neighbors take it upon themselves to watch the kids and try to make the most of the situation they are under by making it fun inside the apartment. Due to this, I would say the theme is family and always trying to make the most of any situation—even if you are living in the middle of a war zone. Lesson Objective: Students will be able to learn about the Civil War in Lebanon and the United States and compare and contrast the two wars. What do you think you would have done if you were in Zeina’s shoes when her parents did not return? If you were to all of a sudden have to take care of you siblings, what would be some of the activities you would do with them to keep a positive mentality? Students will research the Cold War that happened in Lebanon and the United States and present a chart that compared and contrasted the two wars. McDaniel, L. (1995). Six months to live. New York: Bantam Books. From the moment I read the little summary on the back of the book I was already intrigued. When I was younger, I LOVED reading these types of books because as a person of that age, you try to imagine yourself dealing with the same issues (at least I do anyway). Within the first three chapters, I already found myself getting the goose bumps when she was describing how she felt receiving the news. I squirmed when she was describing how it felt to be injected (I hate shots) and just found myself not being able to put the book down. Just by trying to imagine what I would do if I were in Dawn’s shoes made me realize how blessed we have it to not be going through such a terrible disease like cancer. In the beginning of the book, Dr. Kneeland came in and talked to both girls about having a positive mindset and I couldn’t help but think about my mom right away. My mother always told me when I was sick to keep telling myself I wasn’t. She would always tell me, “Your mind is the biggest weapon you owe so if you start to think it, you start to believe it.” This exact motto is what the doctor was trying to do with the girls: have them think positive. Throughout the book there was that reoccurring theme of always living the moment regardless whether they had cancer or not and I loved it since that is what I live by: living life positively and in the moment. The plot of the story was told from the beginning, she is a normal 13-year-old girl who now has cancer and has to live through it and the changes that come with it. Although that was told straight off the bat, I think the plot was also in the middle when both her and her best friend are told they are not sick anymore but then they both receive the news that they are. This plays with the reader’s emotions (at least mine) because you go from happy because they are cancer free to sad because they are sick especially when Dawn receives the news that Sandy passed away. The setting mostly takes place in the hospital and a summer camp. The story is told in third person limited since you can only tell what Dawn feels at times. I think the reoccurring theme thorough out the book is to live the moment, which I love since I live by that everyday. Honestly, the book was so good; I would definitely read it with my students if I were to ever teach that grade level. Lesson Objective: Students will be able to compare and contrast the different characteristics of each character throughout the book. Why did Dawn’s friends treat her differently when they found out she had cancer? In the middle of the story, both Dawn and Sandy go to a summer camp. Have you ever been to one? If not, what camp would you want to go to? Share your experiences. Why do you think Sandy’s dad refused to let her get the bone marrow surgery? 1. http://www.imdb.com/title/tt1078588/ ( This is the movie “My Sister’s Keeper,” with the permission of the families, I would play this movie in class and have them compare characters. Park, B. (1999). 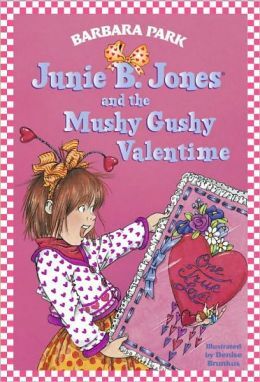 Junie B. Jones and the mushy gushy valentime [i.e. valentine]. New York: Random House. I absolutely love the Junie B. Jones series! I remember reading them as a kid and I loved reading her stories and how crazy she was! With this book specifically, I loved how she had her own secret admirer. As soon as she said she was missing one, I knew it was going to be Jim because as a reader it is always the person you least expect. I loved reading her reaction to everything and just reading the book made me think about how much I loved these books as a kid. I can relate to this book in particular in the series because I love Valentines Day and as a teacher, I plan to make it a fun day in the classroom as well. The setting is in Junie B. Jones’ classroom and on the playground. The first plot of the story is when Junie B. Jones has to figure out what card is missing. After she finds the card, she needs to figure out who gave it to her since it is signed, “your secret admirer.” The theme is Valentines Day and “puppy love” and I absolutely love it since I am a huge hopeless romantic. Lesson Objective: Students will be able to create their own “Valentines Card” of appreciation to their parents. Why were Lucille and Grace arguing outside on the playground? What prize did Junie B. Jones win when she turned in her Valentines cards? Why did Jim want to keep “liking Junie B. Jones” a secret? Standards-based lesson activity: Students will go around and write something nice on everyone’s paper on their desk. 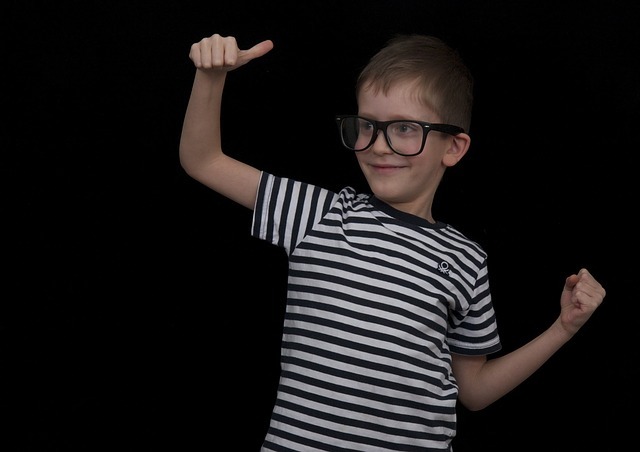 The point of this activity is to get everyone to realize that everyone gets along and have students feel good about themselves after reading their own paper. Tak, B., & Hopman, P. (2011). Soldier bear. Grand Rapids, Mich.: Eerdmans Books for Young Readers. I actually really liked this book, and I am not one to like books related to war. When I began reading the book, I thought it was a made up story but after realizing it was based on a true story, I thought it would be awesome to bring to the classroom. The only personal connection I have with this book was my dad was in the Marine Corps so when I began to read about how “not scared” they were, it reminded me about my dad and the stories he would tell us. I would definitely use this book in my class because I feel the story is told in a manner that is both informative but entertaining. I would use this book as an outline to teach my students about World War II and use both events in history and book topics to come up with prompts for the students. I would also use this as a way to get my students to be more appreciative of people serving in the military and have everyone write a letter to a soldier overseas. The setting takes place during the time of World War II in Iran, Egypt, Italy, and Scotland. The point of view is told in third person omniscient. 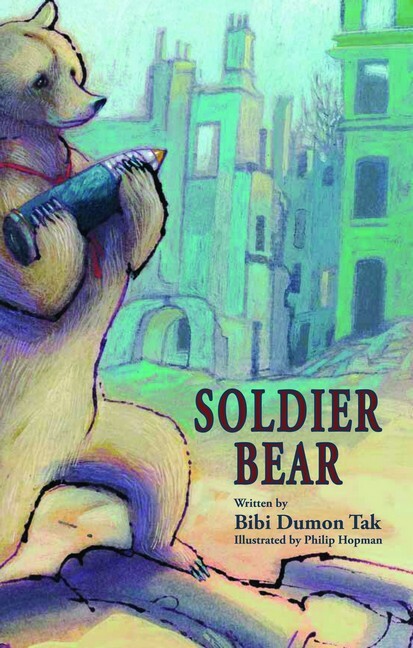 The main theme of the book is seeing how the bear grows and changes throughout war and seeing how the soldiers around him act as well. I would think there are multiple mini plots throughout the book. Obviously, the main issue is surviving the war but many little plots include getting approval from sergeants to take the bear with them, dealing with the bear when he is scared, and having people trust that the bear is harmless. Students will be able to compare and contrast events from the book to other events that happened in World War II. What are the Pros and Cons of bringing a wild animal to war? If you could choose any animal to bring to war with you, what would you bring and why? Did you like the ending? Why or why not? Would you have done the same thing? What would you have done differently? Palacio, R. (2012). Wonder(p. 213). Random House Children’s Books. I absolutely loved this book. I really do not know whether it is because I was really emotional this week but this book brought me to tears, laughs, and overall just made me more appreciative of those around me. When I began to read the book I did not know what to expect and was surprised that it didn’t begin to talk about race since this week’s theme was cultural diversity. It wasn’t until a few pages in that I realized this is the perfect book for diversity amongst kids. I can relate to this book a lot from reading how Auggie felt, to the way Via reacted to the kids at school. Personally, I have two autistic cousins and it would make me so angry to hear them speak about how they were bullied at school. Since I couldn’t go to their school, I remember always feeling frustrated because I couldn’t do anything to stop the other kids so reading how Auggie felt really hit home for me. Another person I related a lot with was Via. Now, although I do not have a little brother with a deformity, I do have a little brother who is overweight. Growing up, I always stood up for him when I would hear the kids make fun of him and he would always just shrug it off. I also related most to Via when she said, “So I’ve gotten used to not complaining, and I’ve gotten used to not bothering Mom and Dad with little stuff.” Growing up, I was blessed to have a big family but with being the big sister comes a lot of responsibility. At one point I was babysitting seven kids and it drove me crazy but I learned to not bother my parents with the little things and just do things on my own. Again, although in the book the environment at home was completely different from mine, I could really relate to Via. The story takes place in multiple places but the main places were at home and at school. In the beginning of the book, the story was being told in first person point of view by Auggie but towards the middle and end it was told in third person from Via’s point of view, Jack’s, Justin’s, Miranda’s, then back to Auggie. The reoccurring plot in the book was how people treated Auggie due to his facial deformity. The only theme I could think of was how Auggie and those around him changed as the book went on. Objective: Students will be able to compare and contrast the characters of the book and write about their actions and feelings. What does Auggie do when he wants to cry? If you received a phone call from the principal asking you to show a new student around like Auggie, would you want to? Why or why not? How would you feel if you were in Auggies shoes? Would you want to go to school why or why not? Student will need to write a one-page story about a time where they defended someone or bullied someone. They need to include where it happened, why it happened, how they felt after, and what they would change about the incident. Bemelmans, L. (1967). Madeline (New Viking ed.). New York: Viking Press. This book was so adorable. I loved how the author rhymed and the pictures were so big yet so simple. I think this book can have several meanings to it like: be different, or be grateful for your health, or even be fearless. All these different meaning pertain to my life every single day. In the book Madeline is very different from everyone else because she does what she wants and does not fear what is in front of her, (She growled at a tiger.) which is something I tell my niece every time I see her. It’s okay to be different then everyone else and she should not be afraid of anyone. At the end, I found it funny how all the little girls were crying that they wanted their appendix taken out but Miss Clavel told them to thank the lord they are well. This made me laugh because it reminded me of when I cried to my mom that I wanted a cast on my arm like my brother. She told me the same thing Miss Clavel said and now that I ‘m older well, I’m very happy I haven’t broken a bone. 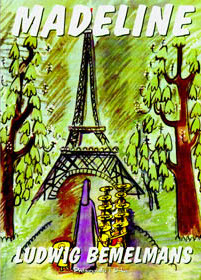 The setting of the book took place in the town of Paris, the home in which the little girls and Miss Clavel stayed, the hospital, and the room in which the girls slept in. The story is told through third person point of view because the book says things like, “Little Madeline sat in bed” and “Miss Clavel turned on the light.” The plot of the book happened when Madeline was rushed to the hospital for her appendix. 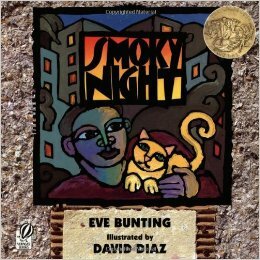 Objective: Students will be able to create a poem using rhyming words. How many little girls lived in the house? What are some things that made the girls frown? What was the biggest surprise by far that Madeline had? Activity: The students will need to create a poem about their home using rhyming words. I actually really liked this book for the classroom. I think it is a great book that discusses conflict and how through tough times, you manage to get closer to people. Although this book was about how cats don’t get along, I think it can relate to many situations in real life where you may dislike someone, but in times of need you need to watch over one another. In the book, both cats did not like each other in the beginning but once they were in danger, they put their differences away and comforted one another until they were saved. I can relate this to my personal life at home with my brother. Now of course, I love him but there are times where we are arguing yet as soon as one of us is getting in trouble, the other is there to help defend. I enjoyed how the author took an “adult situation” but managed to make it very kid-friendly. The setting of the book took place in the apartment of the little boy, the streets outside his window, and the shelter in the church hall. The story is told through the point of view of the little boy because throughout the book he uses words like “I” and “her cat”. The plot of the book happened when the little boy and his mama had to leave the apartment due to an unexpected fire and he couldn’t find his cat. Objective: Students will be able to discuss what causes riots and write a paragraph about how people can avoid them from uprising. Why didn’t the little boy and his mama ever go to Mrs.Kim’s store? Where did the firefighter find the cats? What were they doing? After reading the book, do you think the little boy and his mama will start going to Mrs.Kim’s store? Why or why not? If you were awaken in the middle of the night to leave because of a fire, what 1 item would you take with you and why? Activity: The students will be put into groups and will need to create a story that includes conflict between people. The students need to also come up with a problem that rises in the story in which then causes the people in the story to work together. There were three goals I wanted to meet in this Janterm class and they were: to understand the technology that is being used to teach, being able to create material online to use in the classroom, and to create an overall project based learning project. Before I took this class, I was very “old school” in the sense that I wanted to stay away from technology use in the classroom. I am a believer that teachers can teach things and subjects that computers cannot. But after learning about the different ways you can use technology in the class, I realized that computers are not put in the classroom to distract, rather they are there to help the teacher. My Cool Tool Duel Project I realized this was useful when we did the Cool Tool Duel Project! Although it took a while for me to get the hang of it, I actually really liked my video and could really see myself using that in my classroom. I realized videos like that help kids when they are at home so they can re-watch the material they did not understand. After doing the many projects in the past month, I can say that I am more aware of all the cool technology tools out there and I feel so awesome about it! I think I’m just excited because I was never a “tech-junkie” so by learning new tools I can use in the classroom I feel more “modern” and it makes me look more “tech smart” (even though the videos are really easy to make). Overall, this class went by VERY fast paced and although it was rigorous at times, it really did make me realize technology is our friend in the classroom. I think if it used correctly and at the right time, it can really change the learning environment in the classroom for the better. Here is my Final PBQ! I hope you all enjoy it and enjoyed this class as much as I did! Before I began college, I was never really was familiar with ePortfolios. It actually wasn’t until last semester that I began building one and really knew what it was. My take on the ePortfolios were it’s an electronic portfolio that is obviously online and is used to store your information throughout your educational path. The only benefits I saw were it’s a good place to store your important papers and documents (like a USB share drive except an actual portfolio) yet also allows people to comment on your work. I think it is very beneficial to have one throughout college because as i go farther in my education, it is important to keep record of all your papers and important projects so when you graduate you have everything on file. I really only saw ePortfolios as a “storage space” but after I saw this video I realized it can actually be used for more. With students in elementary I find it difficult to use ePortfolios just because I feel majority of their work is done on paper rather than online so I don’t really see how it would benefit them. 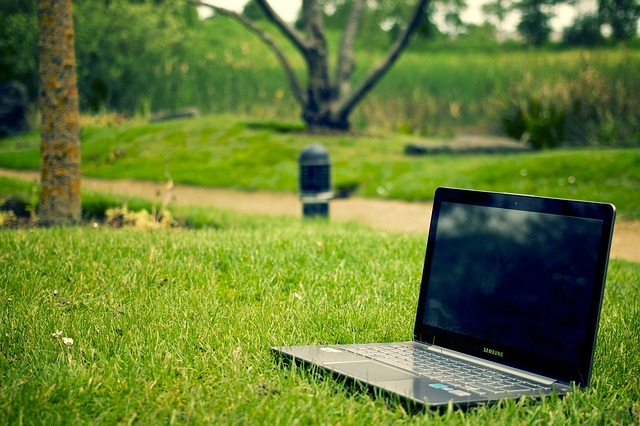 But in students from sixth through twelfth grade I think ePortfolios are beneficial because it allows students to save their work and also makes it easier for teachers to give feedback. I was researching more on e-portfolios and came upon this PowerPoint that discusses what it is, how to use it, and how it is beneficial to students. After viewing it, I realized e-portfolios not only save paper but are the route to go in today’s classrooms. I would have my students create one and have them save their work from all year in my class. I would use it as a way to communicate with them and correct their papers. After leaving my class, I would ask them to save at least one assignment from the years to come that way when they graduate they can see the progress of their education.